Letting go of the dieting mentality can feel like one of the hardest parts of embarking on the Intuitive Eating journey. 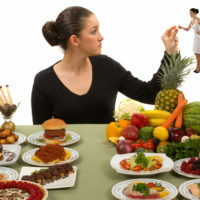 Even as you learn to listen to your own internal signals of hunger, fullness, and satisfaction and to shift your allegiance in this direction, there is a lingering pull toward the seemingly never-ending barrage of eat this, not that; how to ensure that calories in are less than calories out; means of manipulating your metabolism; and whatever superfood or supplement will finally “fix” you. One sure way to decrease the noise of dieting is to not engage with it. If you know that you are vulnerable to being drawn in by these things, reducing your exposure is important. This means not buying the diet books and dieting-focused magazines, not following weight-loss pins, Instagram accounts, Facebook pages, and tweets. No one can eliminate 100% of their exposure to the dieting and weight loss machine. But you can learn to recognize it when it gets through and to question its sources and intentions. Where do they get their information? Is it based in science or anecdote? What are their motives? To sell something? To create dependence on themselves, their program, or their product? To promote weight loss or to sustain health? Are they helping you to become the expert of you? When you focus on your own internal signals of hunger, fullness, and satisfaction, you can start to make important connections. What works for you? What, when, and how much do you need eat to feel content, vibrant, and sustained in your daily activities? What do you enjoy? And what makes you happy? Not participating in diet speak in particular can make you feel like a salmon swimming upstream. At times it feels like everyone else is doing it! Many people, especially women, seem to bond over the commiseration about diet, weight, and their bodies. But taking the risk of doing something different will cut through these superficial connections and help to build real common ground: trust in yourself and a curiosity in others about this approach to true self-care! What Can Meditation Teach Us About How to Eat?